We try very hard to make sure our pricing is fair and easy to understand. We think it is important to customize our services to fit your needs and to only charge you for the items you want refinished. The prices on your estimate are only guaranteed for ten days. Technicare cannot be held responsible for any damages prior to cleaning, such as unleveled gutters, damaged drain tiles, or decayed fascia. We do not clean out the drain tiles if they are clogged. All items will be inspected to determine the best method of cleaning. All work is done to the best of the technician’s professional ability and cannot be held responsible if items cannot be cleaned to perfection due to circumstances out of our control. 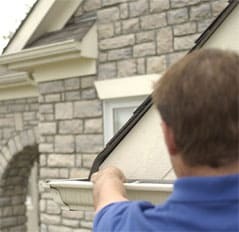 Best local gutter cleaning service at the lowest price! Gutter cleaning can be extremely dangerous. Technicare uses special equipment and techniques to ensure gutter cleaning is performed safely and efficiently. We manually remove debris from your gutters and down spouts. Visit our Special Offer Coupon page for a coupon and call 888.628.CARE today to set up an appointment. Call Technicare today to schedule gutter cleaning in Columbus OH, Powell OH, Dublin OH, Westerville OH, Louisville KY and Atlanta GA! Great service and lovely gentlemen. The guys were efficient and very accommodating.